We finally managed to get the prizes for the 3 winners on the road as it took a while to find a really strong parrot to carry these big bags. Thanks again for all your great entries. Oh yeah - I am still planning to do this on facebook, but time is short very often these days. Oh yeah, still working on that, but at the moment it is kinda quiet around the project as there are others with higher priority! Meanwhile don't forget about the awesome Contest - THE RUSSIAN ALTERNATIVE - our this months additional jungle support partner. Check the rules for this contest and hurry - get some wild barbarians or other figures and let your brushes dance!!! Seriously and honestly: I will not be able to make a second video of this weekend. Time is slipping away these days and work and life calls on me. The class in Paris (France) is now finally prepared and all people interested should have recieved their final invitation email with details and more information about the class. Please make sure to pay in time to confirm your place among the few. There are now 2 classes in Hamburg (Germany) after so many people have been interested in taking part. The first weekend is already filled up to the limits but the second weekend holds still some free spots for maybe exactly you! 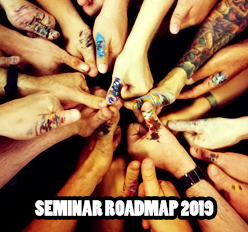 One of the upcoming classes is in July in Ludwigsburg (Germany) and you might be able to get your place due the waiting list - check it here! At the moment I am planning a class in Augsburg, my hometown again, maybe for the upcoming summer months and another class maybe together with Games Workshop in Cologne. Also I got to start planning a class in Vienna, Austria soon. But no more information unless there is more exact talk. Raffa and I are preparing the first follow up class that we will have in about 2~3 weeks in Aachen, Germany. This is gonna be magical we promise. There are still some free spots so maybe we see you in Aachen? If you like what we are doing on Massive Voodoo and you want support us the best way to do so would be a donation via Paypal using the button below. We would appreciate support in any kind. Please notice that your donation strictly goes to Roman/Jarhead/Kong first by using the Paypal button. If you have a special donation wish to one of the apes please write it to your Paypal-Donation. Masterminis - where we learn to be a better painter! Lately I am not using my youtube playlists very often as in Germany there are different rules and it ain't easy to keep a playlist alive - without an institution closing videos for german viewers - and grooveshark already closed in Germany so I am using Spotify, which indeed is great. But here is a little track I really like lately for massive basing power on epic projects - text is kinda stupid but I like the drive. ... and I still don't undersand her very often. 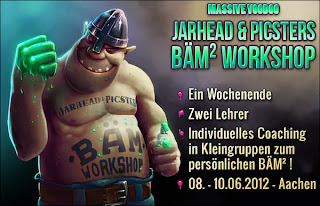 Workshop in Cologne? Looking forward to that, very much!